Rural Development Academy Career Opportunity 2016. 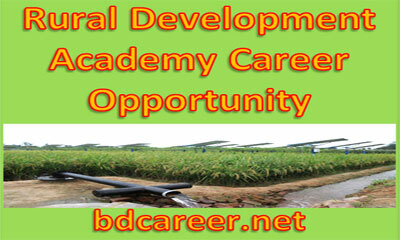 Rural Development Academy Bogra is one of the most popular Government organization in Bangladesh. To extension construction of their newly Rangpur RDA project, the management teams are seeking for temporary candidates. Rangpur RDA Projects will recruit Total 09 vacancies under 06 Posts published a recruitment advertise on 15 October 2016. Interested and suitable Bangladeshi Citizenship applicants are invited to apply. Deadline for submitting the application is 14 November 2016. Interested and suitable applicants may Apply with Particular Form follow with instruction by RDA, Bogra (According to the circularized Conditions & instructions See the Job Circular below as details). To the Director General, Rural Development Academy Bogra (RDA, Bogra), reach on or before 14 November 2016 within office time by registered post office or directly. 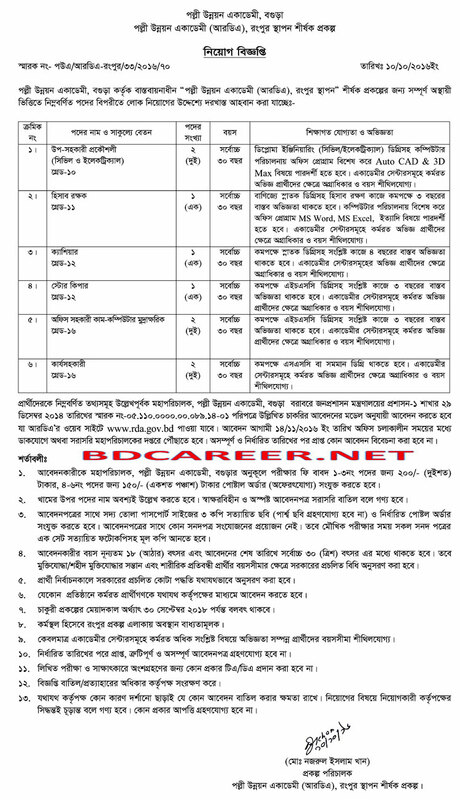 Applicant Instructions: Rural Development Academy Bogra (RDA, Bogra) authority reserves the right to increase or decrease the number of vacancies, any kind of conditions, accept or reject any application or appointment of the candidates without assigning any reason whatsoever. You can also Like & follow our Facebook Group BD CAREER-BEST CAREER GUIDELINE for more details information.